Enhanced recovery after surgery (ERAS) protocols or laparoscopic technique has been applied in various surgical procedures. However, the clinical efficacy of combination of the two methods still remains unclear. Thus, our aim was to assess the role of ERAS protocols in laparoscopic abdominal surgery. We performed a systematic literature search in various databases from January 1990 to October 2017. The results were analyzed according to predefined criteria. In the present meta-analysis, the outcomes of 34 comparative studies (15 randomized controlled studies and 19 non-randomized controlled studies) enrolling 3615 patients (1749 in the ERAS group and 1866 in the control group) were pooled. ERAS group was associated with shorter hospital stay (WMD − 2.37 days; 95% CI − 3.00 to − 1.73; P 0.000) and earlier time to first flatus (WMD − 0.63 days; 95% CI − 0.90 to − 0.36; P 0.000). Meanwhile, lower overall postoperative complication rate (OR 0.62; 95% CI 0.51–0.76; P 0.000) and less hospital cost (WMD 801.52 US dollar; 95% CI − 918.15 to − 684.89; P 0.000) were observed in ERAS group. Similar readmission rate (OR 0.73, 95% CI 0.52–1.03, P 0.070) and perioperative mortality (OR 1.33; 95% CI 0.53–3.34; P 0.549) were found between the two groups. ERAS protocol for laparoscopic abdominal surgery is safe and effective. 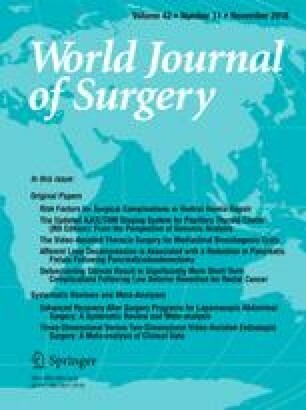 ERAS combined with laparoscopic technique is associated with faster postoperative recovery without increasing readmission rate and perioperative mortality. The online version of this article ( https://doi.org/10.1007/s00268-018-4656-0) contains supplementary material, which is available to authorized users. Zhengyan Li and Qingchuan Zhao performed the experiment conception and design. Zhengyan Li and Bin Bai performed the research and retrieved the data. Zhengyan Li, Gang Ji, and Yezhou Liu performed the data analysis. Zhengyan Li did the paper writing. All authors read and approved the final manuscript. This study was supported by the National Key Basic Research Program of China (No. 2014CBA02002). Zhengyan Li, Qingchuan Zhao, Bin Bai, Gang Ji, and Yezhou Liu have no conflicts of interest or financial ties to disclose.